Additional Info: Born in Perlis Malaysia, A classical cellist currently study first year in Elder Conservatorium of Music (The University of Adelaide) of music under tutelage of Sharon Grigoryan. Shu Yin joined Elder Conservatorium Symphony orchestra since March 2018 and joined Elder Conservatorium Chamber Orchestra in July 2018, performs at Elder Conservatorium of music concert series. 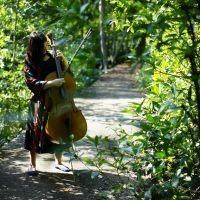 She also performs as a cellist in a string quartet at Malaysia.